In January 1990 Rainbow Woods, a well loved and much used beech woods on the eastern hills above Bath was devastated by winter gales. Bath City Council, who own the site, commissioned an environmental arts project to provide, not only an educational resource for 4 local schools, but also to offer local people a means of understanding the nature of woodlands and the opportunity to celebrate the replanting and regrowth of the new trees. This commission developed to include the production of a teaching resource pack, schools workshops with artists and performers (from Changing Places Environmental Arts Trust) and two days of celebrations for the children from the participating schools, their families and local people on the woodland site in February and May 1992. 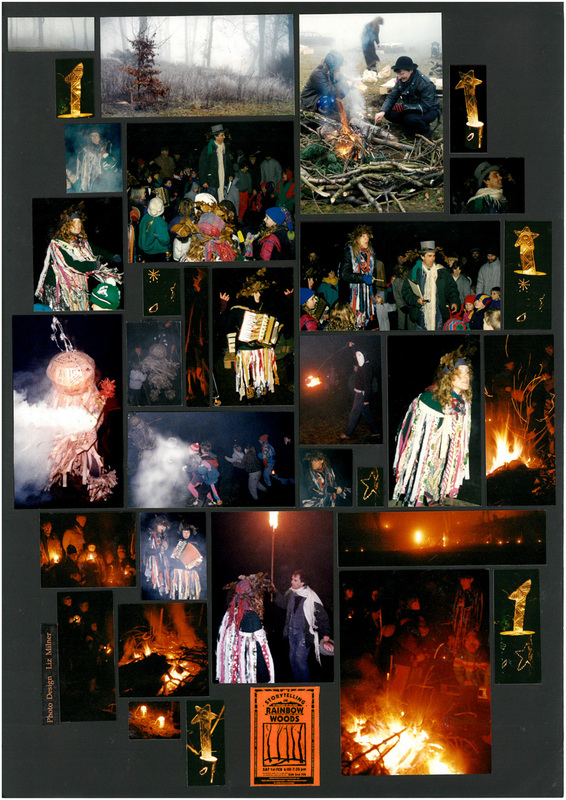 The first image below is a collage of the winter event – a freezing, foggy night with a Whirling Wind creature, some Woodland Harpies, music, lanterns and a bonfire. The other images below are scans of pages of the report made for the clients at the end of the project, I put together the layout using photographs I’d taken throughout the project and the text was written by Peter Milner, the Rainbow Woods project manager (also my partner).